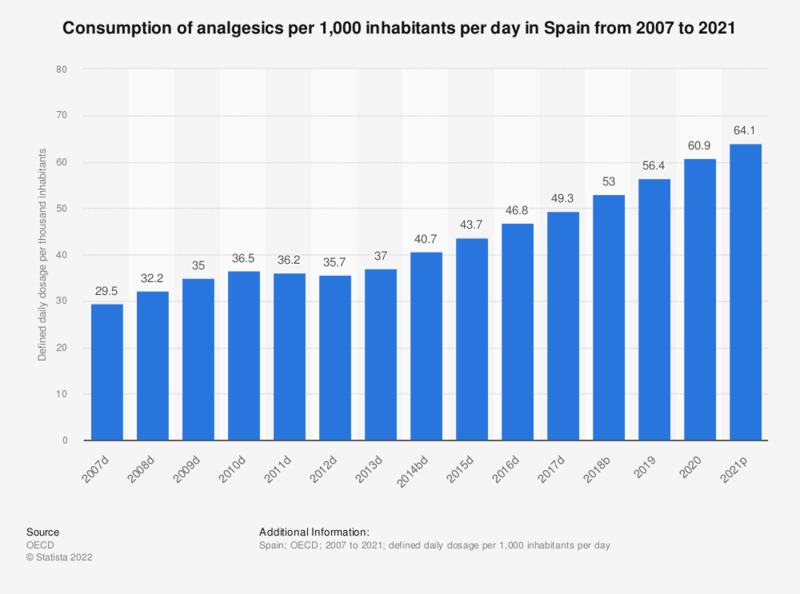 This statistic displays the consumption of analgesics in Spain from 2004 to 2014. In 2014, the defined daily dosage of analgesics in Spain amounted to 40.7 per 1,000 inhabitants per day. These drugs act on the peripheral and central nervous systems producing insensibility to pain without loss of consciousness. Analgesics include paracetamol, nonsteroidal anti-inflammatory drugs such as aspirin and ibuprofen, and opioid drugs such as morphine and oxycodone. * Break in time series. Statistics on "Global pharmaceutical industry"